Falling numbers of first-time buyers will benefit from stamp duty relief over the next decade, with rising property prices meaning around 4m homes across England may no longer qualify. The Government announced in the 2017 Autumn Budget that first-time buyers would not have to pay any stamp duty on the first £300,000 of any home costing up to £500,000. However, according to new L&C research, if house prices continue to rise at the rate they have in recent years, the proportion of properties which qualify for this exemption will fall dramatically by 2028, particularly in the capital where prices have risen fastest. One in five first-time buyers (21%) questioned by L&C said they have changed the area they plan to buy a home in so that they’ll pay less or no stamp duty, rising to 37% of Londoners. Southampton (88%), Norwich (87%), Bristol (87%) and Plymouth (80%) are the areas with the largest proportion of property sales between £125,000 and £500,000 which qualify for first-time stamp duty relief. Only 57% of property sales in London fall between these thresholds, as two fifths of sales are over £500,000 and are not eligible. 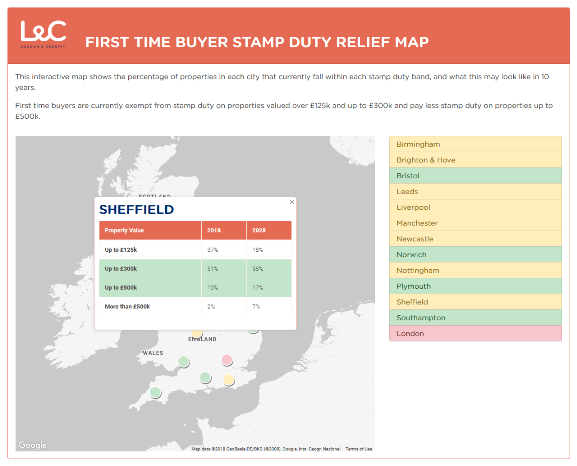 Our interactive map shows the percentage of properties in each city that currently fall within each stamp duty band, and what this may look like in 10 years. Over half of first-time buyers questioned said they felt it is unfair that buyers in some areas of England will benefit more than others from stamp duty relief, whilst almost a third (31%) admitted that they don’t know if they’ll benefit from stamp duty relief when they buy their first home. L&C’s calculations reveal that out of 100,000 recent property sales in line to benefit from stamp duty relief, 30,000 will no longer qualify in the next 10 years. Of course, no-one knows whether house prices will maintain their current trajectory, but if they do, those seeking to buy in the capital could be hardest hit by price rises. More than half of the 52,002 properties that currently qualify for the first-time buyer stamp duty exemption will no longer benefit in 10 years’ time. In contrast, Nottingham will have the most properties within the exemption bracket over the next 10 years, with the proportion of properties that could benefit from a stamp duty discount rising from 51% today to 73% by 2028. “It’s alarming that in cities in the South, so few properties will see any type of benefit from the stamp duty changes in 10 years’ time, says David Hollingworth from L&C. “As a priority the Government needs to ensure that there is a plan in place to review stamp duty land tax (SDLT) relief bands, to guarantee sustained support for would-be home owners now and in the future.